Every baby shower has a general recipe: invitations, decorations, and cake (blue for boy/pink for girl); silly games with prizes; and the oohing and ahhing over cute baby gifts. Traditionally, guys aren’t in the mix, and most will say they have been just fine with that. Until now. The "man shower," or baby shower for dudes, is officially becoming a thing. 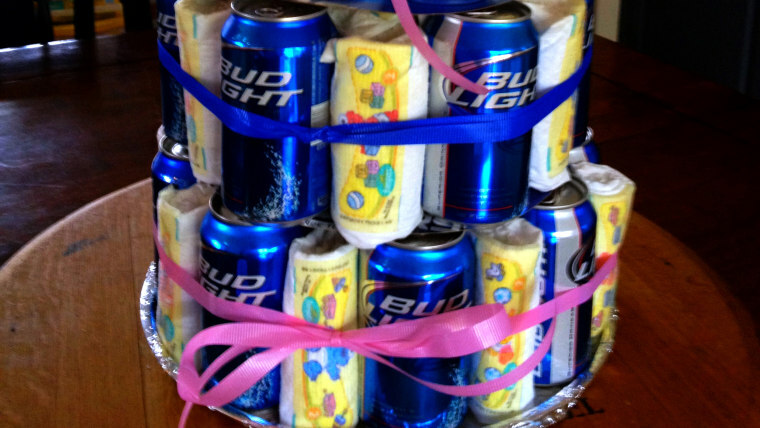 Think beer-diaper cake centerpieces. Stroller Olympics. Invitations with themes like “Huggies for Chuggies” or “A Baby is Brewing.” They are all part of these fetes for dads-to-be, the latest trend blowing up Pinterest. Apparently you can drink beer out of baby bottles while the guest of honor wears a T-shirt that says, “The man behind the bump.” Apparently you can decorate a cake to look like a beer can with a diaper. Apparently all guys really want is a six-pack of Heineken and a box of Pampers. Maureen Anders, a graphic designer in Milwaukee, Wis., and co-owner of AndersRuff, a company that creates custom party invitations, has seen man showers gain popularity, with customers requesting special guy-geared themes. “Barbecue, babies and beer” is popular, she says, and so are poker themes where the “buy in” is diapers and wipes. Daisie Cristobal Sanchez of Whittier, Calif., threw a man shower a few years ago (long ago enough that there was no catchy name for it, she jokes). The guest of honor was a colleague at work who was having his first baby. She says initially co-workers thought it was weird. “They were like, ‘You’re going to have a baby shower for a guy? Why don’t we just get him a card?’"
Sanchez purposely avoided traditional baby shower games at the co-ed event for about 50 guests. All the man shower hype is no surprise to Craig Dexheimer of Minneapolis and Aaron Moniza, of Iowa City, Iowa. The college friends have been celebrating their buddies’ impending fatherhood for a dozen years. But a new idea was born, and as each friend became a dad, the man showers got more intricate, with competitive events such as the diaper football toss and the blindfolded baby stroller relay course. There was a “Survivor”-themed man shower, a rock 'n' roll man shower, and even one themed around a presidential election. And that’s when Dexheimer, who is director of operations for a tax consulting firm, and Moniza, a civil engineer, decided they had a concept worth growing: Create a new rite of passage for dads. Ryan Kautzer, an attorney in Sheboygan, Wis., is the proud new papa of son Frederick, born last week. Last month, Kautzer celebrated his son’s impending birth with a ManShower party, thrown by several of his friends. Kautzer admits he was skeptical at first but the evening was a surprisingly good time. The best part, he says, were the contests like the diaper toss: each guy filled a diaper with water and tried to throw it the farthest. “It’s freezing in March in Wisconsin, so they were like ice diapers. We did it in the street… The neighbors were coming home and all you see is a diaper flying by,” he says, laughing.